Why? There has been change in the adoption myth. Adoptees are human beings, and we are not adapting as well as the adoption industry has mythologized. When we are displaced and taken from our home and placed in American homes, there will be confusion, sometimes anger and more than a few questions coming from the adoptee. As I have said here on this blog many many times, being adopted feels the same as being abducted. Even if the adoptive family is nice, generous and saving you from Third World conditions, adoptees like me question WHY was I adopted? And if you (the adopter) do not tell them, that is akin to a lie. If you adopted from China or Ethiopa, their culture and diet is unique. The health consequences, lack of traditional foods, and the lack of medical history, could be the time bomb waiting for the adoptee adult. Until myths about adoption change completely, until adoption records are unsealed, until every adoptee has the right to possess a copy of their original birth certificate and know their ancestry and name, the Adoption Industry is winning the war with secrecy and deception. 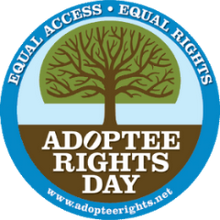 Google "adoptee rights" and you will see there is a battle in the changing world of adoption and the just war is being fought by adoptees.